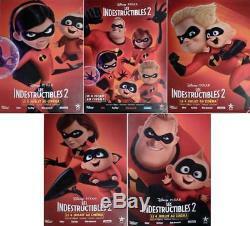 VERY RARE ORIGINAL LARGE FRENCH ROLLED MOVIE POSTERS SET FOR " THE INCREDIBLES 2 " SET OF 5 POSTERS - OUTSIDE ADVERTISING SIZE OF EACH POSTER IS : 47X63 INCHES (120X160 CENTIMETERS) POSTERS ARE ROLLED DOUBLE SIDED POSTERS ARE IN NEAR MINT CONDITION NEVER USED. VERY RARE POSTERS DISPLAYED FOR THE BUS STOP STATIONS ONLY. MOST OF THAT KIND OF POSTERS ARE DESTROYED AFTER USE. SATISFACTION GUARANTEED FRENCH MOVIE POSTERS SHOP OVER 20 YEARS IN THE MOVIE POSTERS BUSINESS. WE OFFER THE LARGEST CHOICE OF NEW FRENCH MOVIE POSTERS FRENCH MOVIE POSTERS IS APPROVED BY LAMP - LEARN ABOUT MOVIE POSTERS - SINCE MANY YEARS ROLLED POSTERS ARE SENT PROTECTED IN A STRONG TUBE. ALL POSTERS ARE PROTECTED INSIDE THE TUBE. Get images that make Supersized seem small. The item "THE INCREDIBLES 2 DISNEY PIXAR RARE BUS SHELTER CHARACTER MOVIE POSTERS SET" is in sale since Sunday, July 8, 2018. This item is in the category "Entertainment Memorabilia\Movie Memorabilia\Posters\Originals-International\2000-Now". The seller is "fmp2000" and is located in PARIS. This item can be shipped worldwide.